Wine terms can be very confusing and terminology for sparkling wine is no exception. First, only sparkling wine that is made in the Champagne region of France can be called Champagne. Even sparkling wine made in other parts of France cannot be called Champagne. In the European Union and many other countries, the name Champagne is legally protected by the Treaty of Madrid (1891), which reserved it for the sparkling wine produced in the eponymous region and adhering to the standards defined for it as an Appellation d'origine contrôlée; the protection was reaffirmed in the Treaty of Versailles after World War I. The official terminology associated with most sparkling wines is based upon the laws of Champagne. Fortunately, these terms extend across the entire sparkling wine spectrum, regardless of where the wine is made. Below is a guide is help you understand what some of the commonly used terms mean as it relates to Champagne and sparkling wine. Methode champenoise or méthode traditionelle: The wine was made in the Champagne style, where the second fermentation takes place in the bottle. All wine is fermented, which is when the sugar in the grape juice is coverted to alcohol. The second fermentation, which still wine doesn't have, produces the bubbles. In addition to Champagne, sparkling wine made in this method from other parts of France are labeled as Crémant, for instance Crémant de Bourgogne. Cava from Spain is also made according to this method. Charmat or Metodo Charmat: This method was created by a French vine grower in Saint-Pourçain-sur-Sioule, in which the wine undergoes a secondary fermentation in bulk tanks, and is bottled under pressure. This method is used for Prosecco and Asti in particular and is now used widely around the world to produce light, delicate sparkling wines. You rarely see this term on the label. Transfer Method: This method will take the cuvée to bottle for secondary fermentation, which allows for the additional complexity, but when the secondary fermentation is complete and the wine has spent the desired amount of time in bottle on yeast lees (six months is the requirement to label a wine 'bottle fermented') then the individual bottles are transferred (hence the name) into a larger tank. The wine is then filtered, the liqueur de dosage added, and then filled back into new bottles for sale. This method allows for complexity to be built into the wine, but also gives scope for blending options after the wine has gone into bottle and reduces the bottle-to-bottle variations that can be hard to control in the "méthode champenoise". Aging on its Lees: When you see this reference in a description of Champagne, it refers to the wine aging on its dead yeast cells which is created through the process of Autolysis - complex chemical reactions that take place when a wine spends time in contact with the lees, or dead yeast cells, after fermentation. This is a vital component in shaping the flavors and mouth feel associated with premium Champagne production. The contact with the dead yeast cells allows the wine to develop the creamy mouthfeel and aromas and flavors of bread dough, nuts, and biscuits. The release of enzymes inhibits oxidation which improves some of the aging potential of the wine. Champagne cannot legally be sold until it has aged on the lees in the bottle for at least 15 months. Champagne's AOC regulations further require that vintage Champagnes be aged in cellars for three years or more before disgorgement, but most top producers exceed the requirement, holding bottles on the lees for 6 to 8 years. Dosage: Immediately after disgorging but before final corking, the liquid level is topped up with liqueur d'expédition, commonly a little sugar, a practice known as dosage. The liqueur d'expédition is a mixture of the base wine and sucrose, plus 0.02 to 0.03 grams of sulfur dioxide as a preservative. The amount of sugar in the liqueur d'expédition determines the sweetness of the Champagne, the sugar previously in the wine having been consumed in the second fermentation. 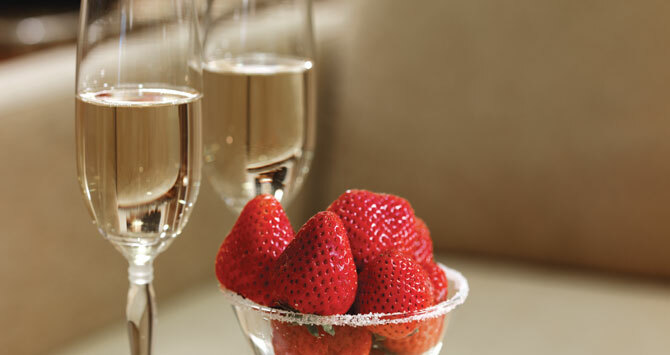 Generally, sugar is added to balance the high acidity of the Champagne, instead of trying to produce a sweet taste. The g/l references the amount of sugar. BRUT NATURE OR BRUT ZERO: 0-3 g/l. Bone dry. EXTRA DRY + EXTRA SEC: 12-17 g/l. These are sweeter than BRUT, but not as sweet as the dessert-style DEMI-SEC and DOUX. DRY, SEC, SECO: 17-32 g/l. DOUX, SWEET, DULCE: 50+ g/l. Very sweet. VINTAGE: These are produced from a single year’s harvest, with a focused expression of terroir. Vintage Champagnes are released only in the best years. ROSÉ: The color does not imply that it will be sweet. The best gain color from skin contact; others add red wine to the initial blend. BLANC DE BLANCS: Usually made from Chardonnay, these are elegant, delicate sparkling wines. BLANC DE NOIRS: Made typically from Pinot Noir and/or Pinot Meunier, these generally have the most body and fruit. GRAND CRU: In Champagne, vineyards are classified. Grand cru is the best. There are more than one hundred Champagne houses and 19,000 smaller vignerons (vine-growing producers) in Champagne. These companies manage some 32,000 hectares of vineyards in the region. The type of Champagne producer can be identified from the abbreviations followed by the official number on the bottle. Champagne made from RM, also known as Grower Champagne, has gained a lot of ground over recent years and offers the best quality to price ratio in Champagne. NM: Négociant manipulant. These companies (including the majority of the larger brands) buy grapes and make the wine. CM: Coopérative de manipulation. Cooperatives that make wines from the growers who are members, with all the grapes pooled together. RM: Récoltant manipulant. (Also known as Grower Champagne) A grower that also makes wine from its own grapes (a maximum of 5% of purchased grapes is permitted). Note that co-operative members who take their bottles to be disgorged at the co-op can now label themselves as RM instead of RC. RC: Récoltant coopérateur. A co-operative member selling Champagne produced by the co-operative under its own name and label. MA: Marque auxiliaire or Marque d'acheteur. A brand name unrelated to the producer or grower; the name is owned by someone else, for example a supermarket. ND: Négociant distributeur. A wine merchant selling under his own name.